I was going to review this when it came out, but I like my statements to be accurate, so I went to the source and interviewed Todd Congelliere first. As the tweetbots like to say: BREAKING--an interview will publish here soon. 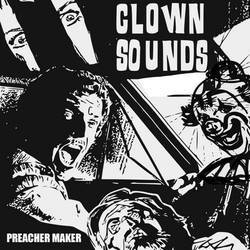 Preacher Maker is the first album under the name of Clown Sounds, fronted by Todd Congelliere, though he also has released a solo record under his own name that used the Clown Sounds title in 2010. With time, the solo project has grown to a full band. So what’s the deal with this record? It’s got 8 songs, it’s about 20 minutes long. This picks up where Underground Railroad to Candyland left off, but it also incorporates a bit of that minimalist solo vibe mentioned earlier. It’s not a solo vanity project by any means, but a way for Congelliere to release new music that doesn’t quite fit his other projects, like the long-running Toys That Kill, which has a dual vocal focus. Like URTC, the songs on Preacher Maker are repetitive and direct. While the lyrics of URTC were especially repetitive, Clown Sounds carries that into the musical progressions as well. It’s a record of rhythm and hooks more than its one of potent melodies or innovative progressions. Like URTC, it has a sunny California vibe, but with a little more of a head nodding thing instead of the energetic pogo-tempos of its predecessor band. Like most of Congelliere’s bands, the song titles are usually reflected in the chorus in a straight-forward manner while the general lyricism a flair for the abstract. When I’m talking about a musician with as such a deep discography, I suppose I’m obligated to keep the comparisons coming. Think of what Toys That Kill might sound like with a single vocalist and more minor keys. Or think of F.Y.P and…I got nothing. Todd’s been in all these bands and you likely know his voice already if you’re interested in this particular scene. Preacher Maker is a fitting introduction for a new twist from Congelliere. He’s never veered too far away from the style of his previous bands, but each project takes that core sound in new directions with a personality all its own. Clown Sounds is a little bit more inward, it has hints of something darker, but it’s dominated by a bouncy disposition and uplifting tempo. Much like URTC, the seeming simplicity of the repetition took a while to grow on me, but that appreciation continues to grow with each repeated listen as the subtleties reveal themselves. Posted Jan. 14, 2019, 10:23 p.m.